Soft, flexible vinyl covers by Alpack Associates dress up your window sample. Our tear-resistant expanded vinyl covers not only protect your sample from the elements, they provide a professional look that distinguishes you from the competition. 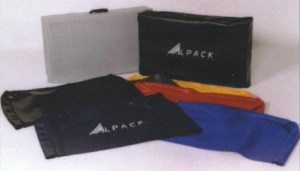 A unique feature of all Alpack vinyl covers is the heat-sealed, double-reinforced handle cut-out that virtually eliminates rips when installing and removing the window sample. Customize your sample by choosing one of our numerous standard colors. Putting your name, logo or promotional message on the cover further enhances your image and increases customer recognition and retention. Standard sizes fit most window samples. Custom sizes are available. The Soft-Sell Cover – for hard hitting results.